« Should I be Shooting in Manual? I often get asked, or read in forums, about what the best tripod is. Like many things in life, what’s best for one person is not necessarily best for another. Only you can define “best”. And, best may change over time as your needs change. My philosophy about photo gear is pretty much all the same. What’s best is what you are willing to drag out with you. The most expensive tripod is worthless if you never care to take it anywhere. You can read my article about what the best camera is here. Like most others, I started out hating tripods. After 35 years, I still dislike using them but I have realized what they can do for me so now I use one when I need one, which is much of the time. Here I will present some options for you to consider. It would be worth taking the time to read my three-part article on image sharpness before continuing with this one. 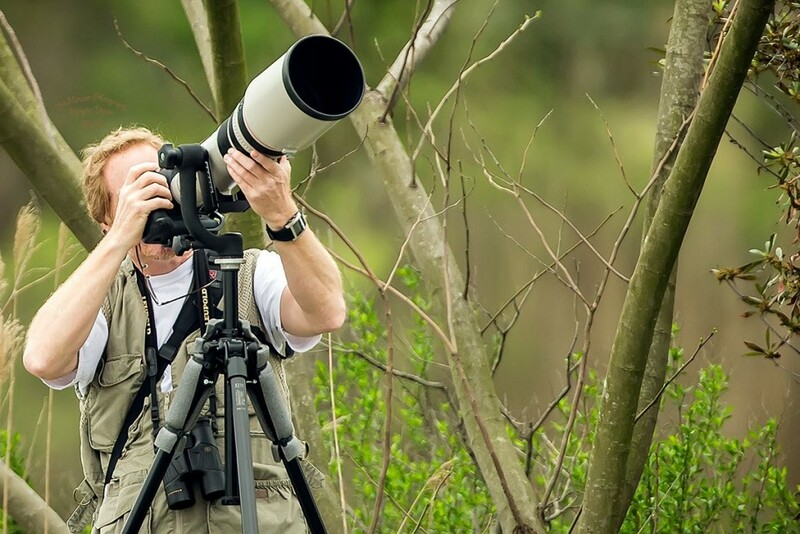 When I started shooting with lenses longer than 200mm and more than five pounds, I felt satisfied with the images I was getting by using a monopod. The monopod is quite useful because it greatly reduces the larger, low frequency movements of the camera-lens assembly – those movements induced by your arms, your breathing, and by the wind to some degree. The monopod also serves as a walking stick while hiking and could be a good item of self defense against wildlife or even other people should the need arise. 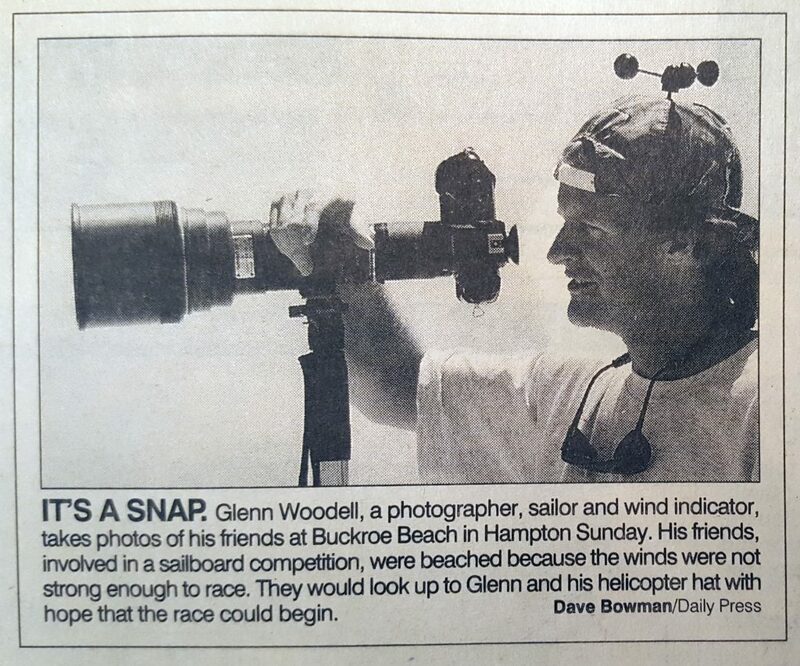 Me, using a monopod with a 600mm lens in my early days. Please ignore the goofy hat. The nice thing about a monopod is that you can get a really good one for not a lot of money. Even the highest priced monopods are not going to be able to compete with an inexpensive tripod so I would never consider putting much money in one. Carbon ones are probably overkill since they are not saving much weight. For the ultimate in stability, the full tripod is a necessity. Ask any serious amateur astronomer where a good chunk of their investment is and they will tell you it is in their telescope platform. Stability is a must for them and for those photographers who use long lenses, shoot in low light, or do both at the same time, it is imperative that you have a solid support. 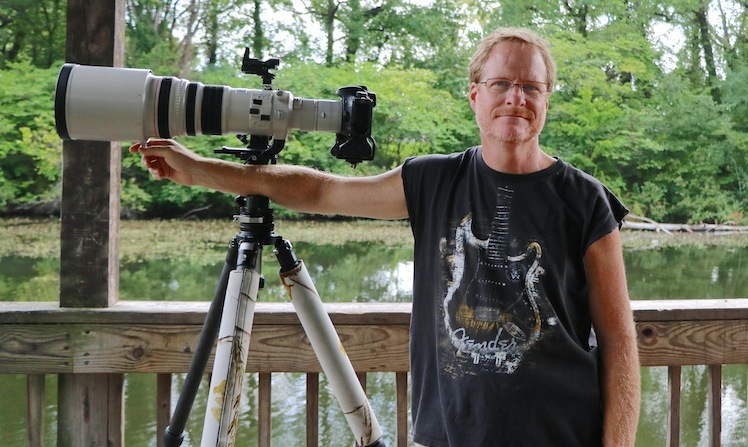 I see many make the same transition that I did – starting out with a lightweight tripod. No one wants to carry a heavy one and the professional ones that are lightweight are quite expensive. 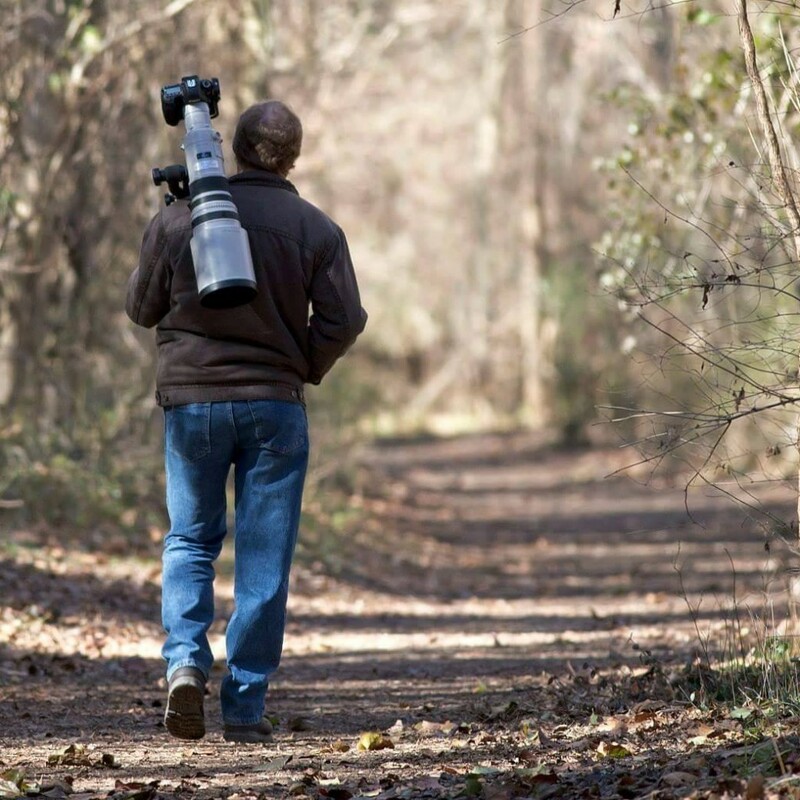 So many are drawn to the “travel” tripods because they reduce to a pretty small size. Please resist the temptation to get one of these. They are lightweight and compact because their legs are thin and they use multiple sections to get them to a usable height. Even at their tallest length, they are usually a little short for shooting at higher elevations because they force you to bend over to compose your shots and they offer little stability over hand holding. Using my 500mm f4 lens on an aluminum tripod with a gimbal mount. Photo by Jim Hansen. Next is the regular line of aluminum tripods that don’t have the “travel” designation. Any of these is probably a good place to start. Even some of the best brands offer models that won’t break the bank. A good one can be had for under $300. I suggest buying a set of legs and selecting a head separately. It doesn’t even have to be of the same brand. Most tripods in this range accept almost any head. The next step up is the carbon variety and this is where the prices start to jump. Carbon products take more time to build but they result in more stability than what aluminum can provide and they do it with less weight. The downside is their price. Although some can be had for reasonable prices, the professional level ones can easily set you back $900 and that’s for just the tripod legs. I resisted moving to a carbon tripod for a long time. Once I got my 500mm prime lens and realized the quality I could get with it, and especially with the 2x extender connected, I really gained a lot of appreciation for higher ISO values of today’s bodies, image stabilization, and the software available to take a decent image and make it wonderful. But I wanted to shoot at lower ISO values…in lower light…and at objects that were moving. And with the heavier gear, the aluminum tripod that I had gotten used to lugging around with me was no longer stable enough for me. The first time I literally touched one of the high end, carbon tripods, I was immediately sold on the concept. These tripods feel rock solid and not flexible like their aluminum counterparts. And with one of the quick disconnect bases, you can easily separate the heads from the legs and have a much lighter and more transportable system. 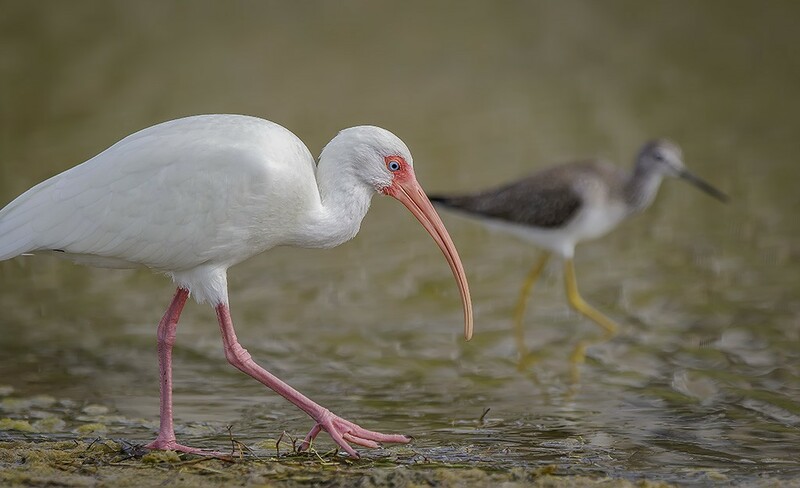 A white ibis hunts for a snack alongside a willet at Little Estero Lagoon, Florida, taken at ground level at 1000mm. Like with many of the other photographic components, it is usually safe to pick a reputable retailer and start with your budget to find appropriate brands and models. What works for me may not be what you would prefer. I will say that once I made the tough decision to spend the big money on what I thought was just an accessory, it made me realize that the high quality tripod is an essential part of my collection of gear. And because these are at the top of the upgrade scale, they are hard to find on the used market. Scouting for pictures the banks of the James River in Richmond. Photo by Wendy Darugar. Whereas I used to avoid using my tripod, even when I had it with me, now it pretty much stays in my truck, whether I am shooting or not. I just don’t leave home without it anymore. Today, my most prized items are my 500mm prime lens and my carbon tripod. Together they do more to optimize my image quality than anything else I own.